Reports such as these have become commonplace in 2014, not only from those in the White House, but also from multiple media sources. Within mainstream circles, the recovery has generally been lauded by the Democratic wing of the media and questioned by the Republican wing. Since the reports stemming from these sources are almost always politically-charged, they have a tendency to be misleading in at least some manner. In the rare instance where genuine information or analysis leaks from the mainstream, it is usually unintended. Ultimately, the intended purpose of these reports are reduced to either showing Obama and the Democratic Party in a good light (by focusing on seemingly positive statistics) or showing Obama and the Democrats in a bad light (by focusing on seemingly negative statistics). Often, the same statistics may be used; however, spun differently. Neither side is interested in formulating meaningful analysis, but in swaying voters one way or the other. Still, in this media tug-of-war, facts are sometimes used to support political arguments, and thus may be useful from time to time. But, even when we catch a glimpse of fairly reliable statistics, how do we cut through the politically-charged spins to give them meaning? Take Obama’s July statement, for instance. It suggests that the U.S. has experienced a strong recovery since the 2008 economic crisis, right? Well, not necessarily. What it says is that the U.S. has experienced a better recovery than 11 out of 12 of its “advanced” counterparts that “experienced systemic crises” (which were handpicked by the White House). According to the International Monetary Fund, there are actually 36 countries that are considered to have “advanced economies.” And considering the global nature of the economy, it’s difficult to claim that 67 percent of them avoided systemic crisis. When compared to the 36, the U.S. ranks 12th in the growth of Gross Domestic Product (GDP) and 9th in unemployment rate recovery. Not necessarily bad, but certainly not as good as suggested, which brings us to some other questions: How accurate are GDP and unemployment rates when assessing the overall economic well-being of a country? Why are such macroeconomic indicators used so frequently in mainstream analyses? Do they accurately represent the well-being of the working-class majority, or do they simply represent convenient fodder used to supplement political spins? Let’s take a look. Two major indicators used to determine the overall health of the economy are the Gross Domestic Product and the Dow Jones Industrial Average (DJIA). 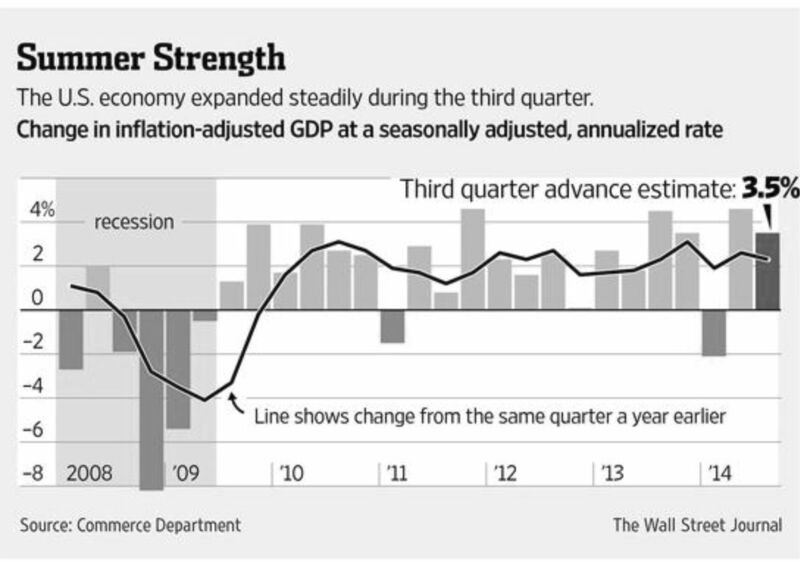 U.S. GDP growth rates over the past six years suggest a strong recovery. Since falling more than 16 percent during the Great Recession of 2008-09, the GDP has experienced growth in 19 out of 21 financial quarters. 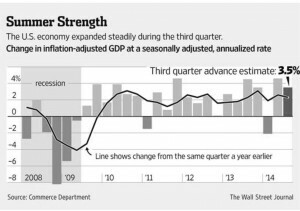 For instance, 2013 was especially successful in terms of GDP growth, averaging over 3 percent for the first time since the recession, while 2014 started out dropping a little over 2 percent in the first quarter (Q1 2014). However, this was written off as an irregularity. Analysts, including PNC Senior Economist Gus Faucher, who attributed the drop to “bad weather that was a significant drag on the economy, disrupting production, construction, and shipments, and deterring home and auto sales.” Since that time, the GDP has been growing at a rate of 4.1 percent over the past 6 months. The DJIA has shown even bigger signs of recovery. After being cut in half between September 2007 (15,865) and February 2009 (7,923), the DJIA has experienced an almost unfathomable boom. It hit its highest point ever in November 2013, nearly 5 years after the recession, at 16,429, and has been breaking records ever since. Heading into November 2014, it was at 17, 390—the highest point in its 128-year history. 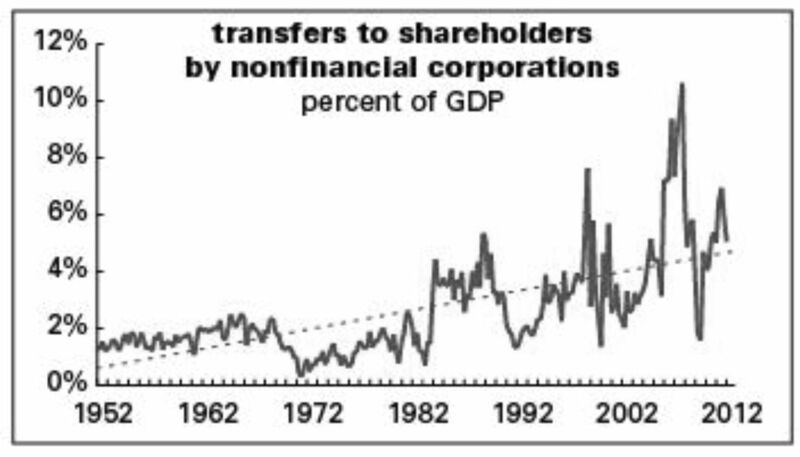 Not surprisingly, the cumulative amount of corporate profits in the United States have paralleled the success of the stock market. 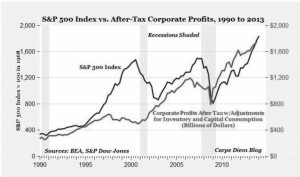 American Enterprise Institute economist Mark J. Perry has illustrated a sharp correlation between the SPP 500 Index and after-tax corporate profits. 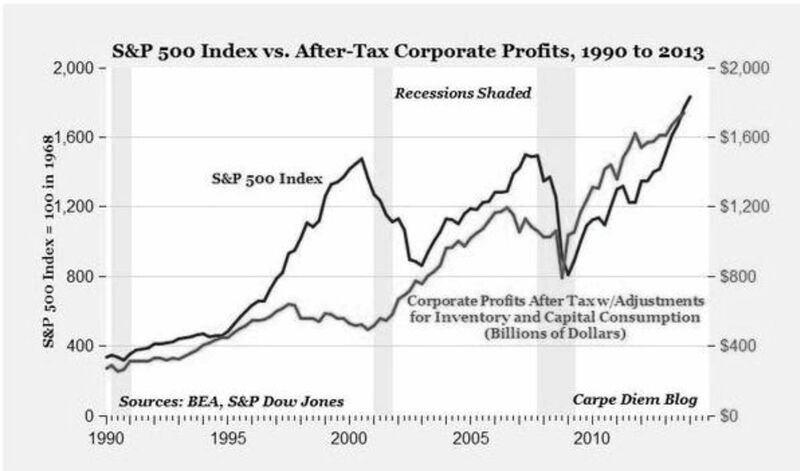 To put the significance of this growth in perspective, at the end of 2008, during the peak of the recession, U.S. corporate after-tax profits totaled $671.40 billion. 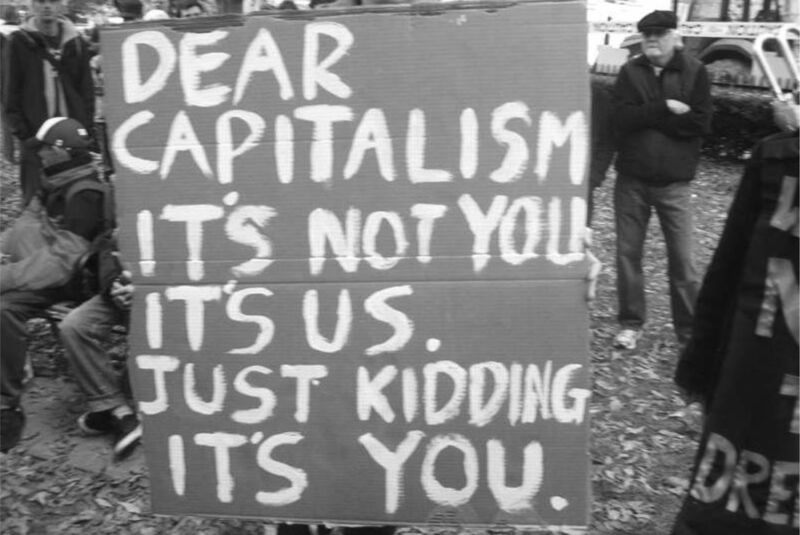 At the end of June 2014, that total has nearly tripled to $1.842 trillion. Another major indicator used to gauge the state of the economy is the unemployment rate. In October 2009, after the residual effects of the recession had settled, the U.S. unemployment rate officially hit 10 percent for only the second time since 1940 (10.8 percent in 1982). After hovering around 9 percent through 2011, the rate has steadily decreased over the past few years, dropping below 6 percent in September 2014—a level untouched since July 2008. This new 6-year low in the rate includes 1.9 million people dropping from the ranks of the unemployed, and the number of “long-term unemployed” falling 1.2 million over the past year. According to the U.S. Department of Labor, “employers added 248,000 jobs in September (2014)” and “payrolls have expanded an average 227,000 a month this year, putting 2014 on track to be the strongest year of job growth since the late 1990s.” The job growth rate in 2014 included a 300,000+ jump in April. And much of this expansion has been fueled by the private sector, which “has now added 10.3 million jobs over 55 straight months of growth” since the recession. These lost categories include “people who have given up looking for jobs or work part time because they can’t find full-time position.” In 2014, as unemployment statistics suggest a vast improvement in labor participation, “more than 9 million Americans still fit into these categories, about 60 percent—or 3.5 million—above prerecession levels, according to the Labor Department.” Evan Horowitz explains: “Let’s say there are 100 people either working or looking for work. If 94 of those people have jobs, and six are seeking jobs, then the unemployment rate is 6 percent. “Notice that a lot hinges on people ‘working or looking for work.’ Say you want to work, but the job market is bad and you decide to put off the search until conditions get better. You’re still unemployed, just not counted as unemployed by the government. Furthermore, the unemployment rate completely ignores income. In other words, even rates that are considered to represent “full employment” (4-5 percent) essentially mean nothing if a considerable number of jobs pay poverty wages. Because macro-indicators like the DJIA, GDP, and unemployment rates are severely flawed in their ability to reflect standards of living and economic well-being for a population, it is important to evaluate how the majority is fairing in this so-called recovery. Despite steady job growth, new jobs simply do not stack up to the jobs that were lost. In sectors that experienced severe job losses due to the recession, workers are earning 23 percent less today. The average annual salary in the manufacturing and construction sectors—a particularly hard hit area—was $61,637 in 2008. It has now plummeted to $47,171 in 2014. Similar adjustments to income levels imply that $93 billion in lower wage income has been created during the recovery—meaning workers, across the board, are receiving a much smaller share than they were before 2009. A report by the United States Conference of Mayors (USCM) also showed that “the majority of metro areas—73 percent—had households earning salaries of less than $35,000 a year,” hardly a living wage for families facing ever-rising commodity prices. In May 2014, there were 46.2 million Americans on food stamps, a slight decrease from a record 47.8 million in December 2012. According to the U.S. Department of Agriculture, 14.8 percent of the U.S. population is currently on the Supplemental Nutrition Assistance Program (SNAP). Prior to the recession, the percentage of the population requiring such assistance hovered between 8 and 11 percent. According to the U.S. Census Bureau, “in 2013, there were 45.3 million people living in poverty” and “for the third consecutive year, the number of people in poverty at the national level was not statistically different from the previous year’s estimate.” The official poverty rate is at 14.5 percent. Between 2008 and 2013, the number of U.S. households with a net worth of $1 million or more increased dramatically, from 6.7 million to 9.6 million. Households with a net worth of $5 million and $25 million respectively also increased. “There were 1.24 million households with a net worth of $5 million or more last year, up from 840,000 in 2008. Those with $25 million and above climbed to 132,000 in 2013, up from 84,000 in 2008.” The U.S. government, or more specifically, the Federal Reserve, has been instrumental in this uneven recovery that has been characterized by massive corporate profits and booming millionaires on one side (a small minority), and falling wages, increased poverty, and frequent reliance on food stamps on the other side (a large majority). 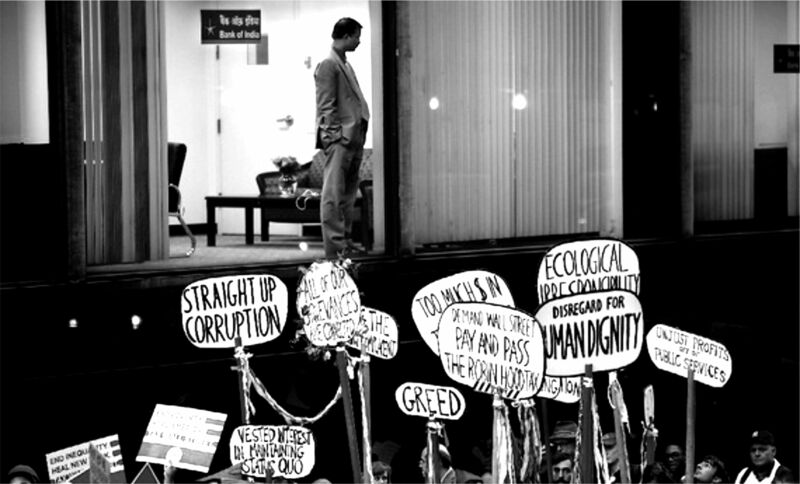 According to a September 2014 study by the Harvard Business School, the widening gap between America’s wealthiest and its middle and lower classes is “unsustainable,” and “is unlikely to improve any time soon.” The study points the finger at “shortsighted executives” who are “satisfied with an American economy whose firms win in global markets without lifting U.S. living standards” for American workers, and therefore create an extremely polarized population where a majority of workers are disenfrachised from the business world. The practice of quantitative easing (QE)—“An unconventional monetary policy in which a central bank purchases government securities or other securities from the market in order to lower interest rates and increase the money supply”—has become common during the recovery. 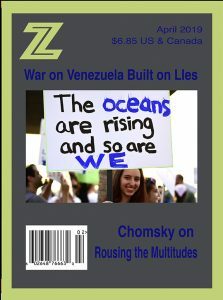 Essentially, this practice “increases the money supply by flooding financial institutions with capital in an effort to promote increased lending and liquidity.” After three bouts of QE, all occurring since the recession, the Federal Reserve has acquired $4.5 trillion in assets, while adding at least $2.3 trillion of additional currency into the economy. When considering the top-heavy recovery numbers, and increased misery for the working class, this comes as no surprise. And it certainly comes as no surprise to political economist Doug Henwood, who reported such trends in 2012: “Despite the strong recovery in cash flow, to record-breaking levels, firms are investing at levels typically seen at cyclical lows, not highs. Some cash flow is going abroad, in the form of direct investment, but still you’d think returns like these would encourage investment. Instead, they’ve been shipping out gobs to shareholder. “Though not at the preposterously elevated levels of the late 1990s and mid-2000s, transfers are at the high end of their historical range. The Great Recession—like the 2001 recession before it, the 1990-91 recession before that, the 1981-82 recession before that, the 1973-75 recession before that, and so on—was the result of deeper systemic deficiencies. While the emergence of financialization opened the door for manipulative and predatory finance tricks (credit default swaps, mortgage-backed securities, NINJA loans, etc.) and helped to construct an impressively profitable house of cards, it is only part of the story. 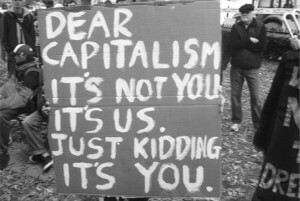 Ultimately, it is the boom and bust, cyclical nature of capitalism, along with its perpetually falling rates of profit (not cumulative profit), that are truly responsible, though almost always ignored. The nature of this latest recovery suggests that the final nail in the working-class coffin, whose construction has been underway since the birth of neoliberalism, has been secured into place. Despite desperate measures used to pump massive amounts of currency into the economy through QE, virtually none has trickled down to the 99 percent. It’s like déjà vu, all over again…and again…and again. Colin Jenkins is founder, editor, and social economics department chair of the Hampton Institute.